You’ve never budgeted like this. You need a budget. Forget everything you know about budgeting. This is not what you think it is. You need a budget that aligns your money with your priorities, a tool that helps you make your hopes and dreams a reality. You don’t need some dry spreadsheet. You need a budget that is adaptable and flexible (yes, that’s a budget), one that you can change as your life circumstances change. You don’t need rigid formulas that break every time real life happens. Your budget is nothing more–and nothing less–than a map of your priorities. When you hear the word budget, you probably think about spreadsheets and accounting (egads!). You think about restriction or denial. Let those stereotypes go. Your budget is your priorities, all laid out. So you can reach them. Let those misconceptions go. Many people struggle to budget because they’re not really sure what their priorities are. We all have likes, desires, and dreams. We might have goals. Even whims! But have you really thought about your priorities? Maybe your priority is spending more time together as a family. Maybe it is getting through college debt free, or eating more local, organic produce. It might be a fancy new car or a trip to a fantasy golf course. Maybe it’s escaping the anxiety of being deep in debt. We can’t tell you your priorities. They’re all yours. We can teach you exactly how to align your money with your priorities. The result will be something you’ve probably never experienced – perfect confidence that your money is doing precisely what it should. The first thing you need to do, though, is some thinking and talking.The task is to simply spend time clarifying what is most important to you. What brings you the most joy? Define your priorities, either by yourself or with your partner. Write them down. Sit with them. Change them a few times until they feel just right. You don’t have to go into nitty-gritty detail here, but it’s critical that you take the time to decide what’s really important to you. It will guide everything else you do. Imagine finding yourself with a free afternoon – three hours to do what you please. What’s most important to you? Imagine you’ve decided it’s important to eat together as a family, especially if you can supply some of your own food. Related to being healthy, you want to make exercise a part of your daily life. You decide to spend one hour running, one hour preparing dinner, and one hour weeding your backyard garden. Then you remember you’d also like to read a novel your friend recommended. You’ve been trying to reward yourself with a little bit of entertainment, right? If you want to read, you’ll need to re-prioritize. Is reading a book more important than running, cooking, or weeding? Could you read for slightly less time and take a shorter run? The choices are yours, but no matter what, it’s a finite amount of time. It really doesn’t matter what you end up choosing to do. It only matters that you engage in the process of prioritizing. When you do, your time will be aligned with your priorities. If you don’t prioritize your time, it will be gone, and you’ll wonder where it all went. It works the same way with your money. Because money is also finite, no matter how much of it you have, you need to prioritize where it goes. As you prioritize what’s most important to you, it will become clear where you should spend your money. Consider this: you need to give every one of your dollars a job. Decide in advance what you need it to do, where you need it most. You’ll work only with the money you actually have, and give a job – only one job – to each dollar. Once you give a dollar a job, it will just sit there waiting until it completes the job, or until you decide a different job is more important. They’re your dollars and your priorities. It’s the process – assigning the dollars – that’s most important. This is Rule One: Give Every Dollar a Job, the foundation of your budget. As you prioritize your money, you may encounter two feelings: the fear of scarcity, and a temptation to be less than honest with yourself. This is scarcity. It doesn’t actually matter how much time you have or don’t have. Scarcity is simply that feeling of wishing there were more. Time. Money. Dessert. You name it. This is an important moment. The feeling of scarcity might tempt you to quit budgeting. To decide it isn’t for you. But when you step back and embrace scarcity, you make good decisions. When you recognize your time is finite, you appreciate it more. You are more intentional about how it’s spent, more likely to align it with your priorities. Pretend that scarcity doesn’t exist, and you could easily waste an entire day binge-watching old episodes of The Office. When you realize your money is finite and name one and only one job for each dollar, money starts to feel a little bit scarce. Even if you have a lot. Anticipating this feeling is what keeps a lot of people from budgeting. But scarcity is good for you. No, we don’t want you to run out of money. Or never buy anything fun again. We want you to notice, as you give every dollar a job, that there is a finite number of them. It’s one reason to make sure that you really do name a job for each dollar. Your awareness will grow that every time you spend a dollar, you are making a choice. Consistently making choices that align with your priorities will make you happy. When you run away from scarcity and try to forecast how much money you might have down the road, you take your focus away from right now. It’s easy to imagine more money coming later and put off prioritizing in the present. Think about your money and what’s most important to you. Those important things deserve your attention, and the attention of your money. Sure that might mean some other things get less of your money. But that’s honest. When that money starts to feel scarce, where might you be inclined to be less than honest? When you are giving every dollar a job, you might be tempted to assign dollars based on how you wish things were instead of how they really are. Go back to the afternoon with three free hours. You could be dishonest with yourself and pretend each activity will only take you half an hour instead of the whole thing. You could be dishonest and skip over budgeting for a whole activity (like the shower after your run…). Either way, the effect is the same. By wishing things were different than they are, you create a situation where your time isn’t fully aligned with your priorities. You end up spending your time where it isn’t best served. You end up frustrated. If you wish you only spent $500 on groceries, but have made a reasonable effort to change it, and you have spent $600 the past four months, you should budget $600. Perhaps that doesn’t sound like budgeting because you’re “giving in” to the habit of spending $600. But so far, it’s reality. If there’s one thing your budget needs to be, it’s realistic. Every decision you make impacts other decisions that follow. If you budget $500 for those groceries instead of the $600 you’re very likely to spend, that’s $100 you’ll go and spend elsewhere. But that’s not realistic! You know you’re going to need another $100 for groceries in the end – so send those dollars to groceries at the beginning. Be honest with yourself and with your budget. You’ll sleep so much better at night. Sometimes an hour, or even three hours, isn’t enough. Sometimes you leave too many hours until the very last last minute. You’ve been there. Your parents and your teachers always told you not to procrastinate. But you still do. Imagine you’re getting ready for a visit from your in-laws. The house needsto be cleaned. But you’ve left it all for the day before. So you spend all day doing it. You’re scrambling. You don’t have time for anything else, and you end up ordering take-out at the last minute for dinner (and that’s not how you imagined spending the money you budgeted to restaurants, by the way). The job gets done, but not as well as you’d like, and you just about pulled out your hair. You didn’t plan. You didn’t break up the job into manageable pieces. Imagine, instead of trying to finish it all at the very last second, if you had taken an hour on Monday and cleaned the guest room. Easy peasy, no stress, and still time for an hour in the garden. Imagine on Tuesday, you had spent two hours washing floors and vacuuming. It was a big chunk of time, sure, but it felt manageable. Then Wednesday you had spent just an hour cleaning all the school projects and stacks of mail off the dining room table (you know, the one you don’t ever use except when your in-laws visit). Still time for an extra-long run. All this pre-preparation made Thursday, the day before they arrived, almost relaxing. All you had to do was go grocery shopping and clean the kitchen. This was a big two-and-a-half hour job, so it felt good knowing all the other tasks had been completed. You budgeted your time. You smoothed out the craziness and avoided the stress by not trying to find one big chunk of time at the very end. Because preparing for the in-laws’ Friday visit isn’t just a Friday (or Thursday) task. It’s a Monday, Tuesday, and Wednesday task, too. But we often don’t think of our time this way. Instead, we fool ourselves by not embracing the true demands on our time. When you make progress now on tasks that need to be done later, you flip this around. You use your time in ways that are truer to your actual needs. By planning ahead, you smooth out the ups and downs. You lower your stress level and sleep better at night. Imagine if your finances felt the same way. Imagine never dreading the arrival of a big bill. When you embrace your true expenses, you can budget now for future needs. It’s like a down payment on larger, less frequent expenses. You say you will set aside money for your annual insurance premium, but how often are you caught by surprise? If you put away a little bit every month, the money will be right there waiting for you. With some of the money you have now, you can prepare for next winter’s high heating bills. Or next summer’s vacation. You know these things are coming, and you can and should be ready. Instead of scrambling to pay a massive orthodontist bill (they’re all massive, no offense to orthodontists) all at once, the money will be there before the bill, just sitting in your account. There’s no stress about where the money will come from because you’ll set some aside each month, just waiting for the bill. Not everything in life is predictable, but Rule Two helps you prepare for those things that feel like surprises. It makes them predictable. Car repairs, home repairs, and medical bills come eventually. That’s not a surprise. You just don’t know exactly when they’re coming or exactly how much they’ll cost. But they will come! When you put money aside for them now, they aren’t stressful later. When we don’t prepare in this way, these large non-monthly bills catch us off-guard. We get that big bill and have to scramble to cover it, putting off other things we need or want to do. This puts all that planning we’ve done for our priorities at risk. With Rule Two: Embrace Your True Expenses, you’ll be ready. You’ll expect the unexpected. You’ll stay on track. There are certain things in life that you know are going to happen, and you plan accordingly, almost without thinking about it. It’s Monday. You’ll get up, get dressed, go to work, and make dinner for the family. Because these things happen every day, you plan for them without a second thought (well, except what to have for dinner, that one haunts us all). We think of these daily, recurring activities as normal. If you hit a lucky month, maybe those are all your expenses. Life feels good. Or maybe it feels like an unlucky month. You’ve got all those “normal” expenses, but you also need to pay for a car repair and a quarterly insurance bill. Meanwhile, winter has set in, and your heating expenses have skyrocketed. You almost feel like someone’s picking on you. Honestly, though, that’s not an unlucky month. Those are normal expenses, too. Combine your everyday expenses and the less frequent expenses, and those are your true expenses. Your true expenses are everything you have to or want to pay for right now, plus everything you’re going to need to pay in the future. They include monthly things like rent and cell phone bills, but also quarterly insurance bills, summer camps, unexpected home repairs, and back-to-school shopping. Since these expenses are not elective, you need to think of them as part of your monthly budgeting. You have to prepare for them. This removes surprise expenses that, well, really shouldn’t be surprises. Think of everything as a monthly expense. Divide bigger, less frequent expenses into smaller, monthly amounts so you aren’t caught off-guard. Like the holidays. They come every year. Same time, too! They shouldn’t catch you off guard. When you consider parties and wrapping and gifts and shipping and decorations and cards … it is a huge expense. Instead of scrambling in just a couple of months to find all that money, calculate what you think you’ll spend, divide it by twelve, and save for it a little bit each month all year round. A monthly holiday bill. It doesn’t matter if your utility bill skyrockets every winter (that’s what they do). If you’ve planned ahead and budgeted monthly, even during the heat of summer, you won’t have to worry through those winter months. You can implement Rule Two today by putting a single dollar aside for something. A single dollar! Today. You’ll be one step closer to budgeting for your true expenses, and it’s a win each time you do it. At first, you may feel like you’re juggling some of your immediate obligations and your less frequent true expenses. That’s okay. Budgeting is a long game. Start by prioritizing your irregular expenses and tackle them one at a time. Just keep moving forward. When you’re budgeting for your true expenses, the juggling stops. The money will be there when needed. You have a free afternoon ahead of you. You’ll weed the garden another ten minutes before you head out for your run. Then you realize (not a moment too late, it’s just how your mind works) that it’s your turn to carpool the kids and their friends to baseball practice. Should you stick with your plan and exercise? Or should you change plans and use that hour to drive all over town picking up 9-year-olds? Remember, you promised. The fact is, we change our plans all the time, even in the course of a single day. When we wake up in the morning, it’s difficult to know exactly what that afternoon will bring. So we adjust. It’s normal. Hopefully, we’re not doing so thoughtlessly, but because we want to keep our time aligned with our priorities, it’s the only way. We don’t give it a second thought. Imagine budgeting your time and then not being allowed to change. You might decide that you’re going to go out for coffee with a friend two Thursdays from now at 9:30. The day actually arrives, and your youngest child is home sick from school. What’s more important to you? Coffee with a friend or caring for your child? Of course you change your plans. But really, that whole premise is absurd, right? You don’t know–you can’t know–exactly what you’re going to do, hour by hour, weeks or months from now. Your finances work the same way. You can and should set broad outlines for your money. Clarify your priorities and set goals. But when the details change, and they will, change with them. Sometimes even our priorities change. It doesn’t mean you’ve failed at budgeting. It’s normal. Traditional budgets, on the other hand, tell us not to change. They tell us to set an amount of money for an expense, and that it’s cheating to change it. Those budgets are rigid. Instead, roll with the punches. When you’ve budgeted $40 for gifts and spent it on a friend, but then realize you have completely forgotten your mother’s birthday, what are you going to do? Not get your mother a gift? Of course not. You adjust. You take some money from entertainment or clothing or … whatever’s most sensible, given your priorities. It works the same way with everything. Massive car repair put you over budget? The money has to come from somewhere. Whether that is next summer’s vacation or this month’s new shoes is up to you. Rule Three: Roll with the Punches. Adjust. Adapt. Breathe. Be confident that you are still on track and moving forward. Don’t Break. Adjust and Adapt. Changing your budget means deciding what to change. Imagine that you have $400 set aside for car repairs, but a repair comes in at $475. You need to move $75 from elsewhere in your budget to car repairs. But where’s the best place to take it from? The answer goes back to prioritizing, and only you can answer that question. Your budget reflects your priorities, but you know that some priorities are more important than others. It might be useful to think about your priorities in groups. There are things you would never touch – anything to do with a roof over your head or health and well-being. At the other end of the spectrum, you still have priorities. But they’re discretionary. They’re things you want, things you like, but things you can do without – entertainment and recreation, for example. In between, there might be a whole lot of other things. These are things that are important to you, but the consequences for not having the money right now are not dire – things like clothing, saving for a vacation, or family gifts might fall here. If you’ve got nothing you can reassign from the lowest level of priorities, you may look to some of these. You may group your categories differently. Maybe you live in Manhattan so dining out is untouchable, or you’d always pilfer from clothing because, hey, you wear the same pair of jeans every day anyway. However you think of your priorities, this is an extension of Rule One. Sometimes you need to reassign the job you originally gave to a dollar. If you don’t, it won’t be realistic; it will be pretending. But in order to do this, you need to actively engage with your budget. Check it frequently. Talk with your partner. Recognize ahead of time that overspending will happen. You’re human, right? Adapting and adjusting for overspending keeps your budget in line with your priorities and your goals. The decisions you make when you budget, thinking through your priorities for the first time, that’s not always easy. Hey, these are important things. This is your life! While the choices themselves may be complex, the process is simple. It comes back, over and over again, to asking yourself what is most important. No matter what that is (we won’t judge you on your priorities if you don’t judge us on ours! ), these rules will guide you to what is most important. You’ve done the big-picture prioritizing. 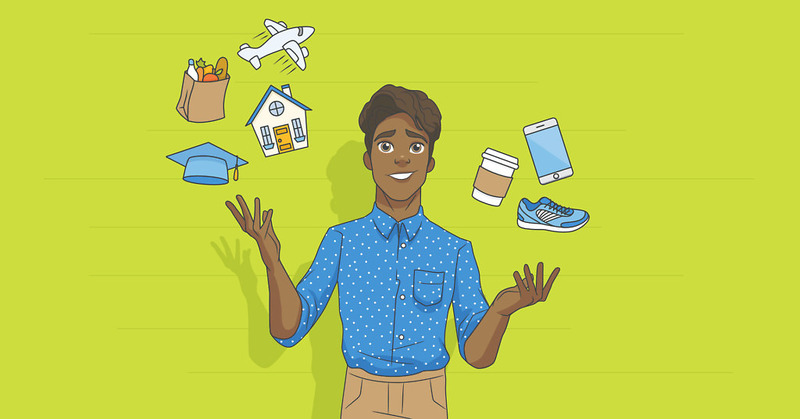 You can see how YNAB’s rules relate to those priorities and how they’ll help get you where you want to go. Stuck on what to do when the rubber hits the road? Not sure what to prioritize first? That’s okay. You aren’t alone, and you’ll get the hang of it. Remember that budgeting is a process, and thinking about your priorities in different categories can help you make it your process. When you sit down to budget, think about each of these jobs for your dollars, and keep on prioritizing until every dollar has a job. Budget first for non-negotiable, they’ll-turn-off-the-lights-if-I-don’t-pay-this types of expenses: rent, food, utilities, medical insurance, and health care. As you do this, question your sense of whether this is a “have to.” Often, we get into patterns of thinking of things as have-to’s when really they’re not. Instead, they may be unquestioned spending habits or patterns. If it isn’t a have-to, set it aside. You can do it! As you budget for these items, your focus is rightfully drawn to those that are happening in the immediate future; by definition, you can’t put off things that are obligations. But you also need to consider obligations that will come later. Use Rule Two to prepare for larger expenses that might be months down the road but that will be just as non-negotiable when they arrive. Have you taken care of immediate non-negotiables and made down payments on future ones? Yet, somehow money still feels tight? Do you feel like your non-negotiables took up essentially all the available funds with no dollars left for anything else? You have a cash flow problem. The amount that needs to go out each week or month is way too close to the amount that comes in. Consequently, there’s no room to budget for anything that might feel discretionary or might actually get you ahead of the game. Your next priority should be to budget for something that is going to improve that balance. Getting rid of your debt payments is the best place to start, especially because of the interest on your debt. Put another way, would you borrow money to put into savings? At a 13% or even 17% interest rate? Of course you wouldn’t. (If you said yes, hurry up and change your answer.) Deal with your debt. When you’ve freed up some space in your budget by dealing with your debt, money isn’t going to need to leave your budget so quickly. Your money will start to get older. You can let your money just sit there, and this will happen all by itself. But you can take proactive steps, too. Imagine that you’ve taken care of your obligations and true expenses and have a plan to deal with your debt. Yet, because you’ve been prioritizing so effectively, you have money left over that still needs jobs. You can send that money right to next month to do next month’s jobs. When you do, you delay the amount of time between receiving and spending your money. This is called aging your money. It brings you the security and stability you’ve always wanted. You’ve taken care of your obligations. You’ve put some money toward improving your cash flow by dealing with your debt and aging your money. Now it’s time to focus on your quality of life. Go back to the big-picture thinking you did before you even began budgeting. A lot of those priorities probably had to do with improving your quality of life. Things that aren’t necessarily obligations but are almost as important as your immediate security and stability. We’re making a distinction here between quality of life and other stuff you might simply want (which comes next, never fear!). What is important enough to you that you’d set a goal for it? Maybe you’d like to take a family vacation or buy a house. It could be smaller: kids’ athletic or school activities or a gym membership. A hobby you are passionate about. It’s up to you; the important thing is that you spend some time deciding what is most important. No matter what your priorities are, this is the time to start directing some money toward those quality-of-life goals. Whether the payoff is in the near future or a long way out, you’ll feel good that every dollar you budget here is fully aligned with those goals. A budget isn’t just about meeting your obligations and supporting your future self. Those things are most important, sure, but you likely have other ideas for your money too. Like stopping for a really good triple espresso sometimes. You don’t need that extra pair of shoes, but you want them. The things in this area are really personal. But they’re not unimportant. Of course, budget needs in this category come last, but don’t leave them out completely if you can help it. Even giving yourself five dollars a month to blow on music downloads can be the difference between feeling constrained by your budget and feeling like you’re doing exactly the right thing for yourself. Stuck on a Budgeting Decision? Are you obligated to this expense? Or is it simply a habit? Will making one decision open up the possibility for others? Will budgeting towards one of these things improve your cash flow in the near future? Will budgeting this money mean you are moving toward budgeting for all of your True Expenses? Does one budget decision benefit multiple people who are affected? Does one budget decision support your future self?